Alternatively, the monitor can be controlled from within the ILabPascal code by using the command FuncMon. This option can be especially important when monitoring scripts which loop through many iterations as it allows you to avoid flooding the console window with too many recorded calls. In the screenshot below you can see that the function call monitor is switched off at line 72 immediately before the program enters a loop. After the loop the function monitor is switched on again (line 78). 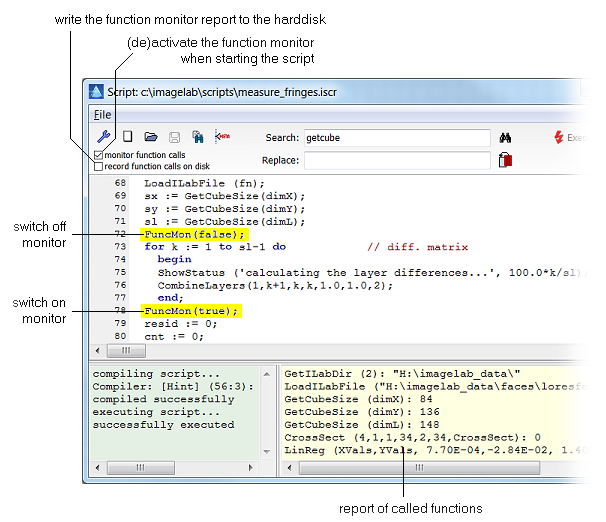 (1) Please note that recording the function monitor output on disk will slow down your script considerably.